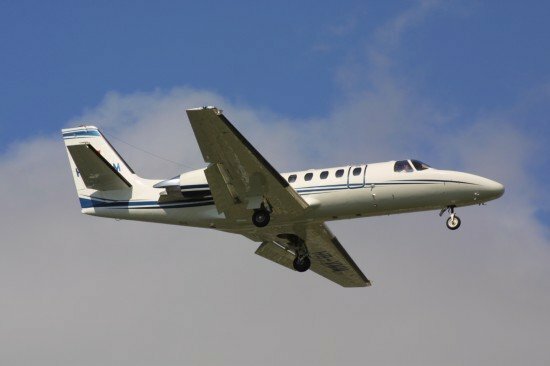 File photo of a Cessna 550 Citation II on final approach. Factual information released by the NTSB suggests that wake turbulence was likely involved in a Cessna 550 Citation II accident in Oklahoma City in 2012. The Cessna 550 Citation II corporate jet impacted terrain while on approach to runway 17L at the Oklahoma City-Will Rogers World Airport (OKC). The pilot was uninjured and the copilot sustained minor injuries. The airplane sustained substantial wing and fuselage damage. The local flight originated from Will Rogers World Airport about 09:20. The purpose of the flight was a local VFR training flight for a pilot under instruction to reset his currencies on the type. Following some air work the crew flew some traffic patterns and two touch-and-go landings. While on a right downwind leg, the crew advised the air traffic control (ATC) tower that they would make a full stop landing. ATC acknowledged, told them to extend their downwind leg, and stated that the controller would call their base turn. The controller then called out the landing traffic that was currently on final approach, which was an Airbus A300-600 heavy. The flight crew replied back that they had the traffic in sight, and the controller cleared the flight to land, number two behind the preceding Airbus, and advised to have caution for wake turbulence. The crew observed their position was abeam the Airbus and estimated that they made the base turn about three miles from the runway. While making the turn, the flight crew discussed wake turbulence avoidance procedures and planned to make a steeper approach and land beyond the Airbus’s touchdown point. Thepilot flying added 10 to 15 knots to the Vref speed as a precaution. The reported winds provided by the tower controller were 180 degrees at 4 knots. The crew observed tire smoke from the Airbus as it touched down near the 1,500-foot runway markings. The flight crew discussed touching down at the 2,000-foot markings and continued. The Airbus continued on the runway, and the tower advised the Citation flight crew to be prepared for a go-around, should the Airbus not clear the runway in time, which the flight crew acknowledged. The flight crew estimated that the Airbus turned off the runway on taxiway F when they were about 1,000 feet from the threshold and about 200 feet above ground level (agl). The flight crew reported having a stabilized approach, and elected to continue while maintaining their planned landing point. When landing was assured, thepilot flying reduced the power levers. When the airplane was approximately 150 feet agl, established on runway centerline, it had an uncommanded left roll to 60 degrees of bank or beyond. The heading swung to the left to about 130 degrees and the nose dropped. The flight crew reported that the airplane was buffeting heavily and that they momentarily lost sight of the horizon. Immediately, the pilot not flying set full power and the pilot flying used both hands on the control wheel in an attempt to roll the airplane level and recover the pitch. The pilot flying managed to get the airplane nearly back to level when the right main landing gear struck the ground short of the threshold and left of the runway. Less than 50 feet after the right main landing gear had touched down, the airplane collided with a small drainage ditch and a dirt service road, causing the right main and the nose gear to collapse. The airplane skidded across a grassy area, across a taxiway, and before it came to rest it “ground looped” to the right in the infield between the taxiway and runway. A small ground fire had begun in the grassy area beyond the taxiway. The flight crew checked each other and immediately evacuated the airplane through the main cabin door. Upon exiting, they observed fuel pouring out of a hole in the left wing and elected to get a safe distance away from the airplane. The investigation is still ongoing and a probable cause statement will be issued by the NTSB after completion of the investigation.